Today Sketch Saturday is one year old and I wanted to participate using Sketch #53. I've had this idea for a child to be looking at a chalkboard, but couldn't quite get the layout right. This sketch was perfect to help me bring my idea to life. Thank you, Sketch Saturday! The name of the stamp is "It shouldn't hurt to be a child". All proceeds from the sale of this stamp are going to "Victims of Violence" and it is still available from Heather's Stamping Haven in Ottawa, Canada. I used my favourite colouring medium, Copic Markers, on this image. 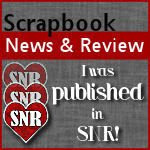 Hop on over to Sketch Saturday's blog and take a look around. There is some serious blog candy being offered to participants of this week's sketch challenge. It's been quite a while since I did one of the Color Throwdown challenges, but I really needed some incentive and challenges help me lots. This is for Color Throwdown #44. This week's colours are: Bordering Blue, Elegant Eggplant and Barely Banana. I was fortunate enough to have all the colours and was eager to participate. The stamp set is SU's Woodland Cottage. I've had it for quite a long time, but don't use it often enough. As you can see the base is Bordering Blue. I used my newest Nestabilities, Labels Four, cutting them out in Elegant Eggplant and Barely Banana. The stamping was done with Elegant Eggplant ink. I added some flowers and a little flower crystal in the centre. As the sentiment does not indicate any type of occasion, I would like your suggestions as to when you would use such a card. Just curious to see what you all would do with it. Thanks for looking. 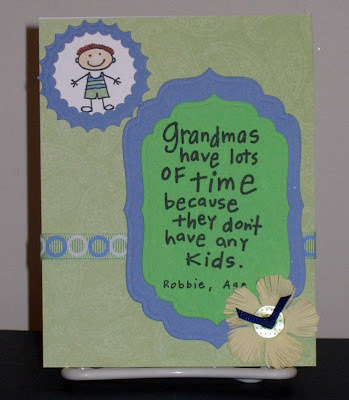 Grandmas have lots of time....?? 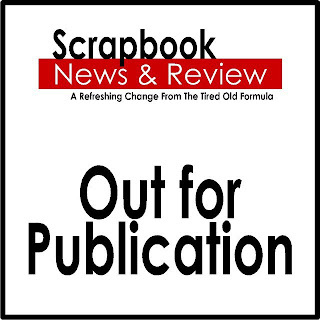 I found this stamp at the Hobby Craft store at Haskins Garden Centre, Snowhill Lane, Copthorne, RH10 3EY in Dorset. My DD's in-laws were kind enough to take me there because they know I love to make my own cards. Being as I was visiting grandchildren, this stamp really spoke to me that day. I also picked up the ribbon and flowers there. too. Yesterday I made this card and used SU's All In the Family set, as well. Today I'm off to visit my BFF, Hazel, for lunch. We've been friends for a very, very long time and it feels so good living close enough that we can get together whenever we want. There is only one thing that could possibly improve this friendship and, it would be that Haz takes up scrapbooking or cardmaking. Just kidding because I know she can't for several reasons, but I love her anyway! Haz does faithfully read my blog and supports me in all other ways with this crazy hobby. I can't ask more than that. Besides, if we did this together we'd never accomplish a single page or card because we don't stop yakking from the moment we get together until we part. I'm going to enjoy her company and our lunch today and plan our next get-together. Maybe we'll include our DHs next time and go to a pub or something. Here's the pics I wanted to post yesterday. Here is the thank you card for Sue, a Lighthouse ATC and an MFT ATC. I met Sue for lunch at Bluewater Mall during my visit to England and she gave me a lovely gift. It was a stamp, some brads and lovely scented soap (albeit the tin is gorgeous, too). I just wanted to say 'thank you', so I made this card using the stamp. I hope you like it, Sue. Next up, are the ATCs. For the Lighthouse ATC, when you make your own background, you can be absolutely guaranteed that each of the nine cards will be different! The MFT ATCs were easy-peasy. 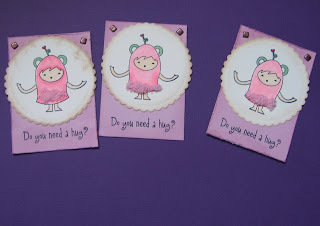 Just stamped, coloured with Copics and added a little FlowerSoft and it was done. I thought the scalloped, circle Nestie was a nice touch. Just a little different for an ATC. I'm finding it tough getting back into regular blogging, but if I just stick to it, I'll return to the habit, nay necessity, to display my cards. I just hope people will return to read and see them. Being in a "creative vacuum" isn't any fun at all but I can feel the excitement returning with each new card I make. Thanks for hanging in with me. I'll try not to let you down. It's been a while since my last post! Well, I'm home from visiting family and friends, "Hi, Sue" in England. 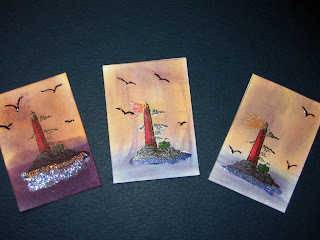 Since I've been back, I've completed a couple of swaps at The Stamp Shack and made one card. Can you believe it, I just went to upload the pictures and they're still on my camera. I'll have to get them onto my computer and then post them here. In the meantime, I do have a video of Owen, who will be 3 years old in a couple of weeks, enjoying a slice of his brother's birthday cake. Enjoy! Isn't he adorable? Have you ever seen such a cute little guy? Of course I'm biased...he's my grandson and today is his first birthday. I'm fortunate to be here, in London, England, to celebrate with him. This is the card I made for him. I just recently acquired the Martha Stewart train punch and thought it was perfect for James. 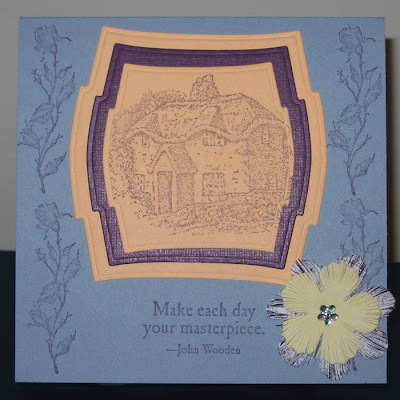 The layout of the card is Recipe #13 by Wendy Johnson and can be found in "The Joy of Cardmaking ~~ Collector's Edition". It was also a challenge on The Stamp Shack which Joanie hosted. The card base is Brocade Blue. The circle is a very dark blue and the image was stamped with VersaMark and then heat embossed using Silver embossing powder. 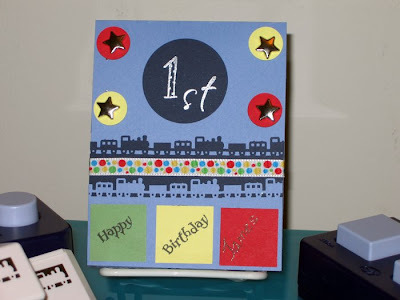 I punched out some squares in scraps of primary colours, stamped Happy Birthday and hand-wrote James. More primary colours for the circle punches, some star brads and colourful ribbon and it was done. I hope my daughter puts it in James' baby book so he can look at it when he's all grown up. 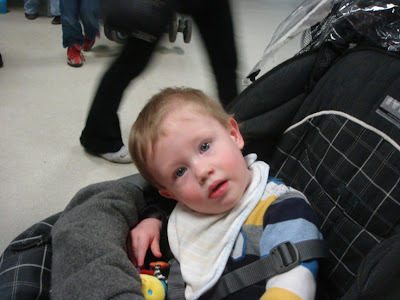 If I can, I'll post some pictures while I'm here in the U.K. because I have another darling grandson, Owen, who is also gorgeous and deserves face-time here on my blog,too. I'm also excited because on May 6th, I'm going to me a fellow-Shackie, Sue/frankiesue, at Bluewater Shopping Centre in Kent. It's fabulous being able to meet Shackies wherever you go in the world. We're quite a community of crafters and love to meet up. Sue, see you in a few days. Okay, gotta go now and have some cake!